The Hue festival scheduled from June 3 to 11 has three main parts. Festivities are designed to be attractive to guests. Emperor Quang Trung’s enthronement ceremony will be reenacted and the national hero Nguyen Hue will make an altar to pray to heaven. He gathers his people before going north to defeat 29,000 Manchu invaders. This is played out on a great stage with approximately 1,000 characters, elephants, horse and weapons. 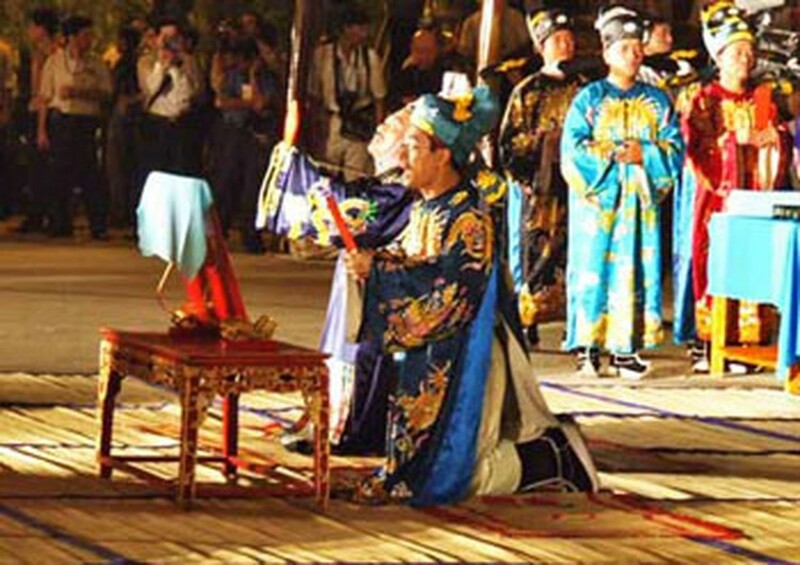 Since 2007, the city of Hue set up an embellished project on a 23-hectare Ban Mountain for this coronation ceremony. Detailed scenarios have been refined. Director Nguyen Quoc Hung from HCMC Television Station will stage-manage this program which presents the magnanimous and indomitable traditions of Vietnamese people. Xa Tac Ritual was an important ceremony during the Nguyen dynasty. It honors the God of Earth (Xa) and the God of Cereals (Tac) in the hope of an abundant harvest and prosperity. The Xa Tac Ritual program will include more than 400 re-enactors with properties, customs, imperial equipment, flags, and ceremony. The Nam Giao Offering Ritual will be performed solemnly as it was under the Nguyen Dynasty when it was held to pray for a peaceful nation and content people. The Royal Music Performance was completely reenacted with 128 sets of dancing customs which have been restored by researcher Trinh Bach for Bat dat Van (Bat Dat Literary Dance) and Bat dat Vu (Bat Dat Martial Dance) dancers. The Examination of Military Doctors festival will create a novel and unique tourist attraction. According to historical documents, under the Nguyen Dynasty, there were three examinations of Military Doctors which lasted for one month each at Hue. Famous martial arts instructors from several parts of the country will be invited to perform as candidates. Tourists and public have an opportunity to contemplate the quintessence of martial art. This is absolutely a new and impressive tourist program. There will be a tourist route from the upper reaches to the lower section for visitors to discover the beautiful and attractive Huong River’s legends from sunset to dawn, as well as enjoy a royal feast on a boat and participate in a night music performance at Phu Van Lau Wharf. The Monuments Conservation Center spent more than VND3 million to build a royal boat. It is 27m long and 6.5m wide with a capacity of 100 people. 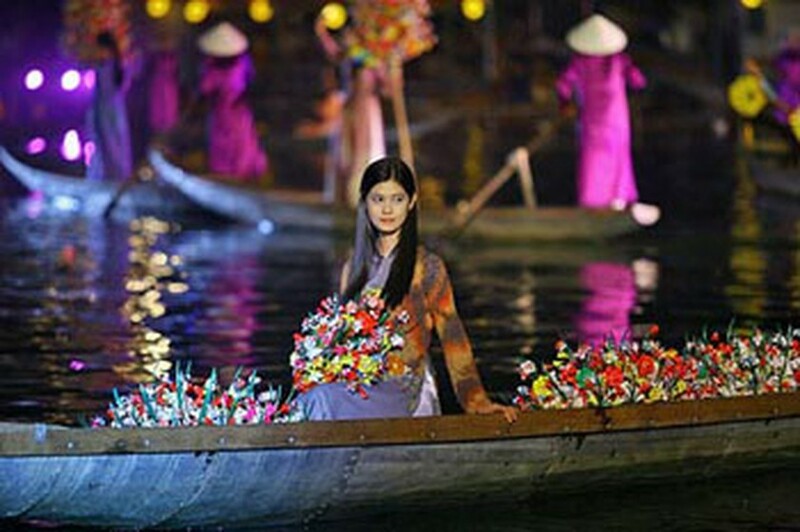 The poetic Huong River will naturally become a great stage for performances. The Royal Night Performance and the Grand Fashion Show of Ao dai contribute more color and gracefulness for Hue Festival 2008. The Hue Festival 2008 is organized to exploit and promote Hue’s cultural heritage, said Mr. Ngo Hoa, deputy chairman of the provincial Hue People’s Committee, and head of the Hue Festival Organizing Board. The festival helps preserve the cultural values of imperial Hue.